Some time ago I stopped throwing away toilet paper rolls, because they can be used in a variety of craft projects. 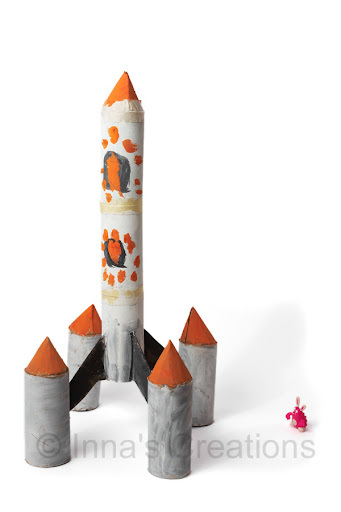 This toy rocket is another example of such easy and eco-friendly kids crafts. You will need 7 toilet paper rolls and a piece of cardboard, I usually recycle an unfolded cereal box for the latter. Start by making 5 cardboard cones as explained step-by-step in Gigantic toy pencils. Then join tree rolls using an adhesive tape to make a long tube. Now you have one long and four short cardboard tubes. Attach a cone head to the end of each. Cut a short vertical slit at the top of the short tubes, and four slits at the bottom of the long one. Fold an origami waterbomb base using a piece of cardboard. From above it looks like a four-pointed star. Cut off the bottom part of the base — this is much easier to do than explain, please see the diagram above. Make a short cut at the end of a star point to create two triangular flaps. Insert the end into the slit of a tube like shown in the picture, open the flaps and glue them to the walls. Do this for all four points of the star. Then insert the star into the slits of the long tube, secure with adhesive. That's it. Decorate the rocket and enjoy your new homemade toy. Wonder what else can be made using toilet paper rolls? 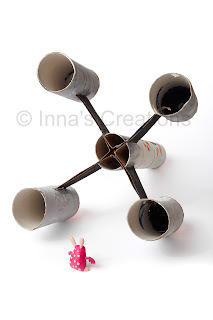 Check out our Cardboard castle, Homemade kaleidoscope, and Toy telescope.